Some people don’t need to worry about wisdom teeth. However, many of us will develop serious complications should wisdom teeth erupt. In order to protect smiles in Des Moines, IA, we will often perform a safe and comfortable extraction, removing these teeth before they put your oral health in danger. How do we extract these teeth, and what impact will these additional teeth have on your smile? Sometimes referred to a third molars, these four additional teeth typically erupt in a person’s late teens or early 20s. At one time, humans needed these additional teeth. However, we no longer do, which is why their arrival disrupts the health and appearance of our smile so severely. Impaction occurs when the teeth can only partially erupt, becoming impacted. The result is often serious pain, infection, or damage to surrounding teeth. Not to mention the risk of misalignment, as even partial eruption means negative impacts on a smile’s overall alignment. When you see us for an exam, we will take detailed digital x-rays and high-quality images using intraoral cameras. 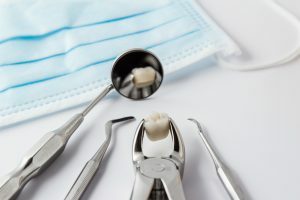 We will then be able to assess the health of your smile above and below the gum line, and see if your smile is at risk due to your third molars. If so, then we may suggest a safe and comfortable dental extraction. We will begin with anesthesia and sedation to ensure patients remain calm and comfortable throughout the procedure. We then open the area and gently remove the tooth in its entirely. We suture the area and then you return home. You will come back to the office for follow-up visits so we can monitor your smile as it heals. Our team will provide detailed instructions on eating and caring for your smile in the hours and days following your procedure. We want to help patients enjoy a fast healing period with no complications. Of course, we don’t just extract wisdom teeth. We may recommend the procedure to correct misalignment, making room for teeth to move into optimal positions. We may also address severely broken or infected teeth. We also remove teeth that have become loose due to periodontitis, the advanced stage of gum disease. In these situations, we can discuss possible replacement options, such as dental bridges, partial dentures, or dental implants. We then restore your smile to full function and beauty, allowing you to enjoy a complete smile. If you have any questions, please feel free to contact our team. Our team can offer a safe and effective tooth removal protecting your smile from third molars. Our practice is ready to help families in Des Moines, IA enjoy optimal oral health. To schedule an appointment, call our office today at (515) 244-9565.